George Washington's first career was as a surveyor. As a surveyor, he gained an intimate knowledge of the backcountry and its inhabitants, a small fortune in land, and a reputation for courage and integrity. Surveying represented a respectable profession in 18th century America and held the promise of social and financial advancement. Over the course of fifty years, Washington completed numerous surveys. Many documenting the settlement of the largely uncharted territory along Virginia's western frontier. 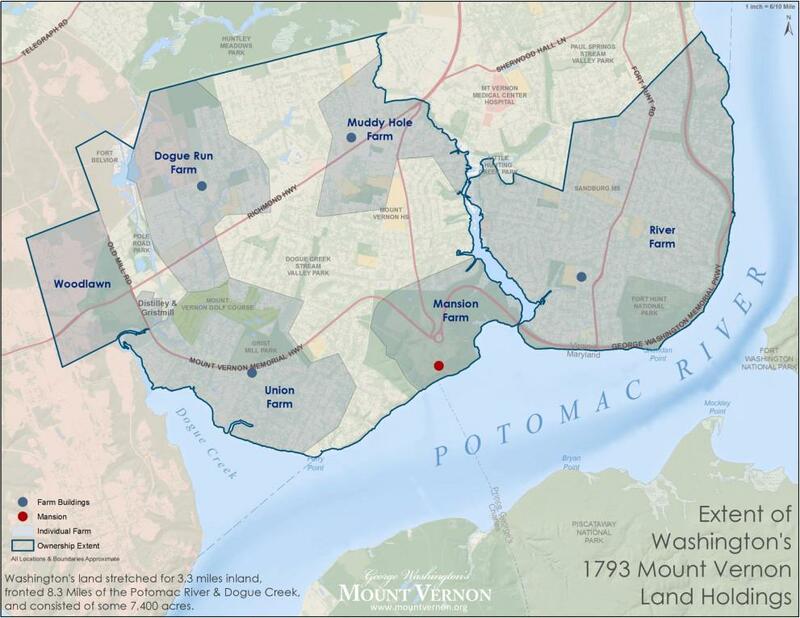 Others laying out the boundaries and agricultural fields of his continually expanding Mount Vernon plantation. During Washington’s early teenage years, he completed many school exercises in penmanship, comportment, and mathematics. Some exercises, such as the Art of Surveying and Measuring Land, provided instruction for practice surveys and included samples taken directly from William Leybourn's The Compleat Surveyor of 1657. Washington must have considered Leybourn's volume an important reference since the inventory of his library included a later edition of it. The formal training Washington received in surveying was complemented by practical experience in the field. The Washington Library recently acquired the 1679 edition of The Compleat Surveyor by William Leybourn from George Washington's personal library. At the age of 13, Washington borrowed the book from his friend and neighbor, Colonel William Fairfax and it remained in his possession for 54 years. 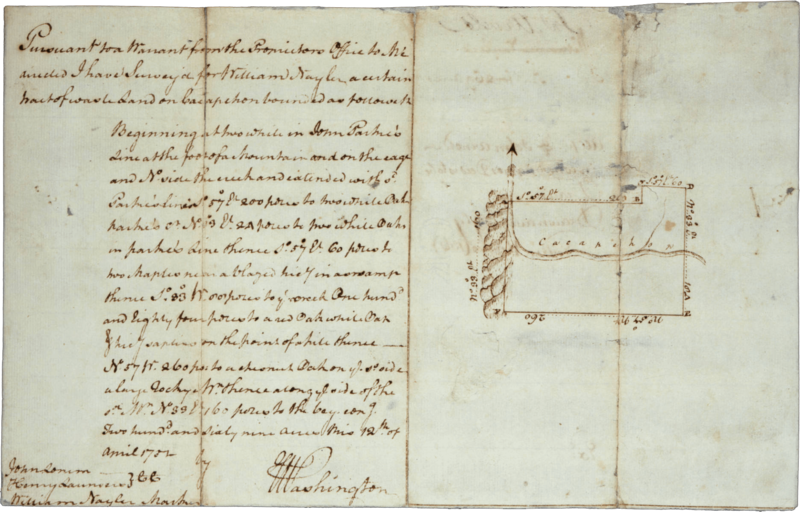 George Washington's plat of Hell Hole from George Washington Papers, Series 1, Exercise Books, Diaries, and Surveys 1745-99, Subseries 1A, Exercise Books 1745-1747: School Copy Book, Volume 1, 1745, Library of Congress. 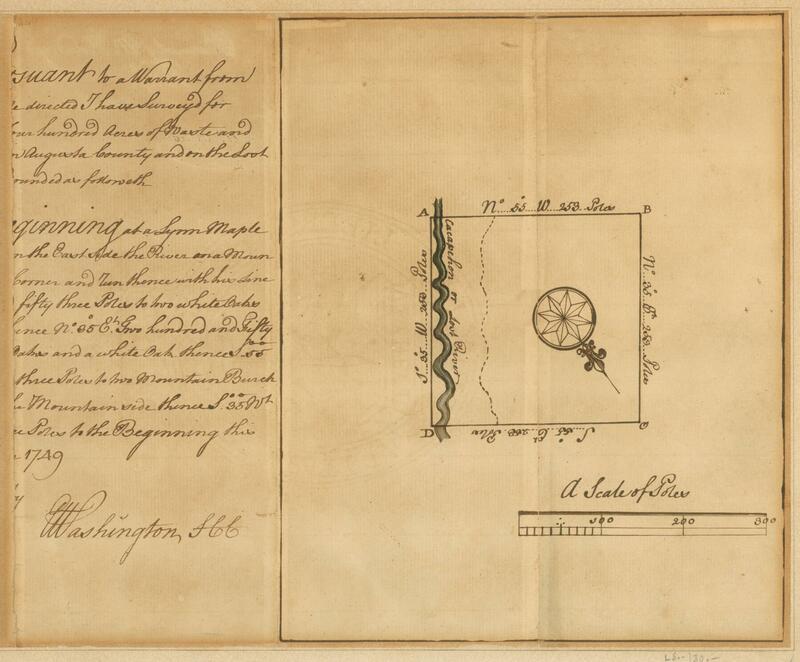 His first attempts at measuring land occurred in familiar territory at Mount Vernon. In the mid-1740s, Washington surveyed five acres for A Plan of a Piece of Meadow called Hell Hole, Situate on the Potowmack near Little Hunting Creek. Along with many other plats, Washington drew A Plan of Major Law[rence] Washington's Turnip Field. Washington's big break as a surveyor came in 1747 when he was invited to join a survey party organized by his neighbor and friend George William Fairfax of Belvoir. Fairfax assembled an experienced team to layout lots within a large tract along the western frontier of Virginia. Over their month-long expedition, Washington learned even more about surveying and gained important experience of living on the frontier. At the end of the first day, a tired young Washington was shown "a bed of straw with one Thread Bear blanket with double its Weight of Vermin such as Lice Fleas etc." Upon getting up the next morning, Washington made a promise "not to Sleep so from that time forward chusing [sic] rather to sleep in the open Air before a fire." 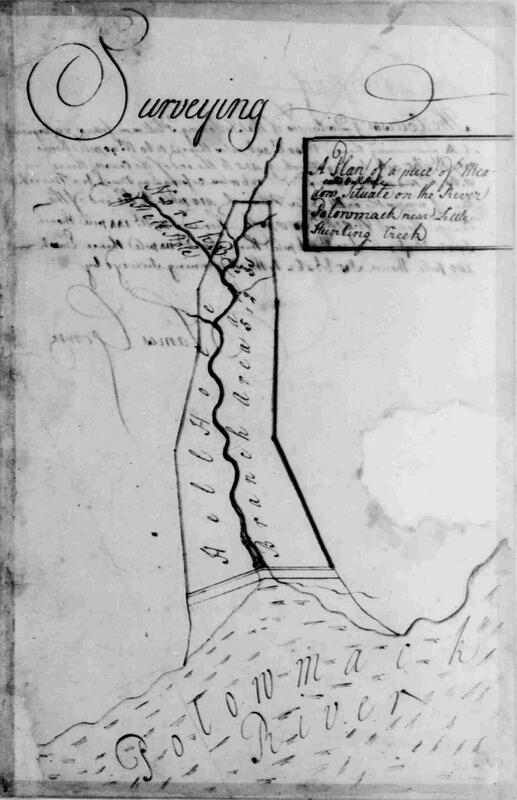 Washington's 1751 survey of "A certain tract of waste land" on the Cacapon River. Washington's career as a professional surveyor began in 1749. He received a commission as a surveyor for the newly formed Culpeper County, probably at the behest of William Fairfax who was then serving on the Governor's Council. Washington immediately traveled to Culpeper, the county seat, to be sworn in. Within two days, he completed his first survey measuring a tract of 400 acres for Richard Barnes. At 17 years of age, he was well on his way to a lucrative career. By 1752, Washington had completed nearly 200 surveys totaling more than 60,000 acres. Washington surveyed 269 acres for William Naylor on April 12, 1752. In accordance with a warrant he had received from the proprietor's office (Thomas Lord Fairfax), he surveyed "a certain tract of waste land" along the Cacapon River. One of the most important tools of the trade was a surveyor's compass. When mounted on a staff, the compass enabled the user to establish a line from a known reference point to the point of interest and determine its bearing. In October 1750, Washington relinquished his position as county surveyor. He continued professionally for two more years, mostly in Frederick County, before receiving a military appointment as adjutant for southern Virginia. Other factors such as his own awareness of diminishing amounts of desirable land in Virginia and the death of his half-brother Lawrence in 1752 may have contributed to Washington's disillusionment with surveying as a career. Although Washington did not survey professionally after 1752, he continued to utilize his surveying skills. He completed at least 50 more surveys, often for the purpose of acquiring new land for himself, defending his property boundaries, or dividing his holdings into profitable farms. At one time, Washington owned nearly 70,000 acres between the Potomac and Ohio Rivers. He continued to survey as late as November 5, 1799, when he "Set out on a trip to Difficult-run to view some Land I had there & some belonging to Mr. Jn° Gill who had offered it to me in discharge of Rent which he was owing me." George Washington died five weeks later ending a surveying career that spanned a half-century. Robert Paulett, Associate Professor of American History at Southern Illinois University Edwardsville, explores 18th-century maps.